We’re excited to kick off the Boosterthon Fun Run at Root in the Spring! 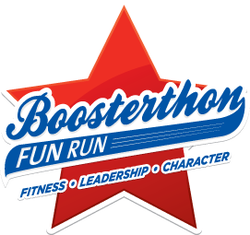 The goal of the Boosterthon Fun Run is to raise funds while teaching our kids about the importance of Fitness, Leadership, and Character. Our goal is to raise $25,000 for lots of wonderful school enhancements, and we need your help to connect your child to sponsors! We are very excited to have the Boosterthon Fun Run Team on campus, as they will be adding value in so many ways to our students and school! Our Boosterthon Fun Run will be TBA this year! 1) LOG ON to your student’s website at www.FunRun.com using your student’s access code on the Pledge Book that came home with them today. Log on each night to watch the Camp High Five character and music videos, and enter pledge information. 2) GET PLEDGES by connecting your student with 10 sponsors. The new funrun.com has many ways to use social media in the pledging process and pay online. Be sure to capture and record the e-mail address of each sponsor, as they will have an easy opportunity to pay for your student’s pledge by credit card online. 3) COME TO THE BO﻿OSTERTHON﻿ FUN RUN! Remember, students will be running 30-35 laps and we would love to have lots of support for our team! Click on links below to learn more about this wonderful program!